Killed when his Avro Anson crashed near Chipping Sodbury about 30 minutes before the Wellington crashed near Grittleton killing Smid and Lindsay. The co-pilot of the Anson Flt Lt Newton-Mold was also killed. Anson T21 VS582 from 1 Air Navigation School, crashed 1 mile east south east of Little Sodbury. Flew into hillside in low cloud at night during BABS (Blind Approach Beam System) letdown to Hullavington. During the war, Bowden had been operating a Blenheim MkIV, L4913, of 60 Sqn attacking the Japenese ship "Awagisan Maru" off the coast of Khota Baru. 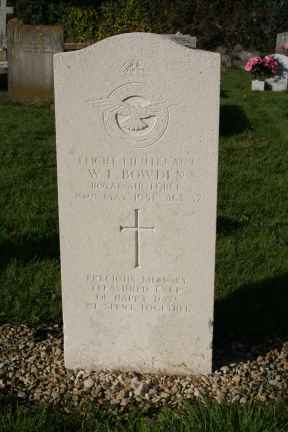 His aircraft was hit by anti aircraft fire and crashed into the sea with Bowden, the only survivor. He spent the next 24 hours clinging to the tail wheel of the aicraft before beign picked up by a Japanese destroyer and becoming the first allied airman to be taken PoW by the Japanese. 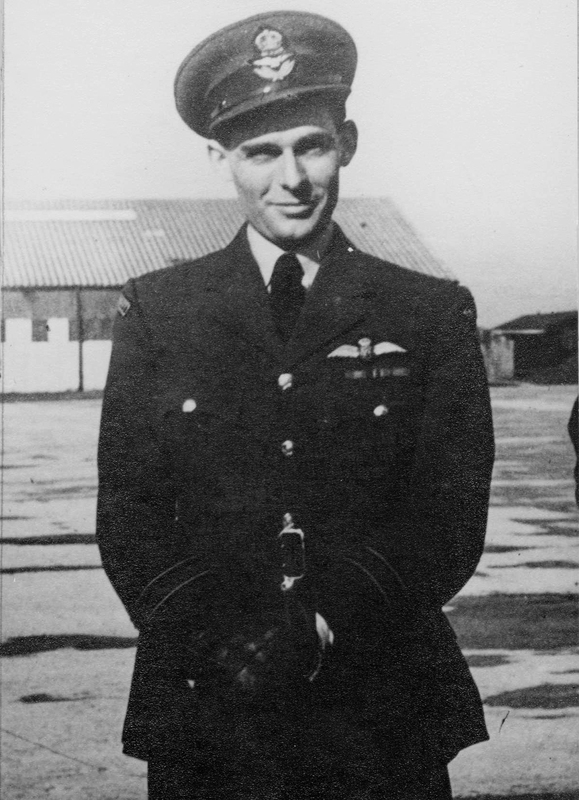 Bowden was a Candian who had joined the RAF. Heroic rescue attempts were made by a member of an RAF rescue squad who twice entered the blazing wreckage of an aircraft which crashed at Grittleton in the early hours of Tuesday morning. The scene of the crash was little more than a mile across country from the aerodrome and within a short space of time rescue and fire tenders were on the spot. LAC Jarrett, a member of the rescue party who come from Dundry, near Bristol and whose only protection was an eye shield twice went into the burning wreckage. The first time he rescued, Officer Cadet Philt and then re-entered the blazing inferno to bring out another crew member who unfortunately died shortly after. Mrs Whiting, Mr Neeld’s daughter who lives at Crowdown said "I was in bed but not asleep when I heard an aeroplane very low. Suddenly there was a terrific flash of light, a crash and a blaze of flame. My husband put a 999 call for the Chippenham Fire Brigade and dressed quickly. Although the crash happened in a field in front of out house, the fire tenders from the aerodrome got there before him". Mr Dennis Whitting, who is a director of Whitting’s Garage, Bath, said "I take my hat off to RAF rescue crews. They were there so quickly you would have thought they had followed the plane along the road. By the time I had put on a pair of Wellingtons and an overcoat and reached the field gat, the first jeep had gone through". Mr LG King who also lives near at East Foxcote Farm said when he reached the crash, he saw one of the occupants lying clear and LAC Jarrett went into the flames bringing out one of the crew. He did a grand job". About half an hour earlier an Anson aircraft also from Hullavington, crashed near the Cross Hands, Chipping Sodbury. Two of the crew, Flt Lt Bowden and Flt Lt Newton-Mold were killed. Officer Cadet LG Clarke who was slightly injured staggered nearly 2 miles to get help after the crash and Officer Cadet N Orr sustained a broken leg. Flt Lt Newton-Mold is buried at Iffley, Oxford.